The University of Miami School of Law’s first interdisciplinary course on the Black Lives Matter (BLM) movement will be open to all students and faculty March 9 when Alicia Garza, one of the founding members of BLM, will come to campus and talk to students. Garza is one of the many speakers who have been invited to the class to speak about the converging societal issues that created the BLM movement. The course was created and is taught by professor Osamudia James, vice dean of the School of Law. James, who has contributed columns on race relations in The Washington Post and The New York Times, has been teaching Torts and Administrative Law for nine years, along with a seminar on inequality in the public school system. She formed the Black Lives Matter course to help explain why a group of people felt the need to breathe new life into a civil rights movement in modern-day America. The interdisciplinary course involves speakers from 19 different UM schools and departments along with local organizations. Two speakers attend James’ Thursday class and discuss intersectional issues, such as disproportionality in child welfare and special education or the use of theater and literature in propelling ideas on Black Lives Matter. James’ law course comes after a two-part undergraduate course about BLM in spring and fall 2016 that took a look at activists and theorists in the movement while analyzing current U.S. race relations. David Ikard, director of Africana Studies, taught the course. The law course was hand-tailored to relate to Miami, with some class sessions focusing specifically on the criminal justice system in Miami-Dade County. Miami-Dade report filings have indicated frequent racial profiling. Such a case involved one young black Miami Gardens man being stopped 258 times by police over the course of four years. Future class sessions will feature individuals from the Community Justice Project and Legal Services of Greater Miami. James has also taken steps to bring the conversation out of the classroom and onto social media. Students in James’ class use social media, such as Twitter, to ask questions about the week’s lecture, using the hashtag “PerspectivesOnBLM.” James said there has been vigorous conversation outside of the classroom. Most recently, the debate centered on robo-policing, or the use of robots in the place of human police officers, and veteran police officers and outside law professors joined the conversation. @OsamudiaJ But distinguishing b/t good & bad reqs a goal, and there are so many diff goals and ways to prioritize them. “I think it’s important that the entire university be able to be involved in the conversation, whether you agree with Black Lives Matter or not, whether you completely understand the issues or don’t,” James said. Law student Amber Dawson said she was excited to participate in the class. 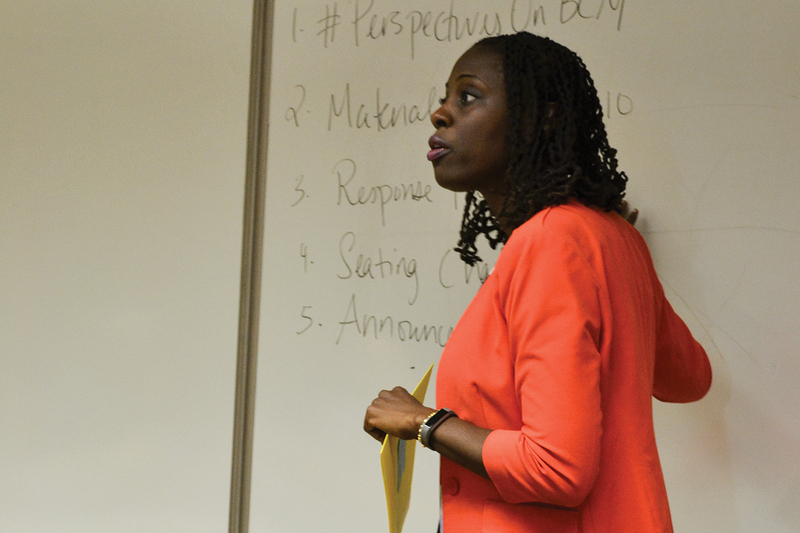 As an African-American woman, Dawson said she was able to relate to several topics discussed throughout the course. In particular, she said she related to visiting speaker Donald Jones’ presentation on dangers certain spaces present to black people. Dawson is planning to write her final paper on the perception of African-Americans as property, aging from slave trade to modern day law. She said the course offers a place for students to talk about difficult topics, a crucial form of education to ensure the progression of society toward equality. “I’m proud to say that I attend a law school where this type of interdisciplinary course is made available to so many students because it allows us to further a conversation I think is very long overdue,” Dawson said. James said she plans to continue the class in spring 2018, with new speakers and new topics to cover. Alicia Garza’s presentation will take place at 7 p.m on Thursday, March 9 in the Shalala Student Center Grand Ballroom.